The use of warm flat roof insulation boards is a way of insulating your home from the exterior by reducing heat loss through the top of the building. This is known as Sarking, and is done by laying rigid insulation boards on top of the rafters and beneath the roof tiles. This is done as opposed to insulation inside the roof in your attic or ceiling. As more and more homes are modified in order to maximise living space, warm roofs (sarking) are becoming increasingly popular. It consists of insulating your roof from above, which will entail removing the tiles and battens. Ideally, a vapour barrier on the “warm” side (the room side) should be installed which can be a sheet of polythene draped loosely over the rafters. Rigid foam board insulation (such as Kingspan or Celotex) can then be pushed down between the rafters, before fixing new battens and retiling, taking care to leave a clear 50mm ventilated gap between the insulation and tiles. If the rafters are only 100mm deep and you want to use a thicker insulation layer, you can deepen the rafters by counter-battening first. Cost-saving implementation: the sarking being lightweight, easy to handle and quick to install allows you to achieve a neat insulation in a minimal time with fewer disruptions. Polystyrene: these are bulkheads, plates or formwork. These panels are often used to build insulated walls. Mineral wool: this material is composed of overlapping mineral fibres. It is a very widespread thermal and acoustical insulation material. Polyurethane: these panels are used for their sound and heat insulation quality, their grip on any surface, their ability to fill empty spaces whatever they are and to allow custom packaging, light and solid. Fibreboard of wood: wood fibre is obtained from grinding fir wood. By adding water to obtain a paste is obtained which produces panels of various densities and thicknesses. Cellulose wadding: This fibre is composed of 90% recycled paper, 5% boron salt and 5% boric acid. The cellulose wadding is used for the attic. Hemp wool : hemp fibres are very resistant and very insulating. Moreover, with its power of thermal insulation, hemp panels are breathable, moisture resistant and absorbent. Spray foam may also provide additional physical strength where a roof is not in the best condition, by holding the structure together. However, missing or slipped tiles must be fixed before applying the foam insulation. Even though the sarking technique may seem simple, it is recommended to call a professional roofer to insulate your roof. Indeed, the work must be carried out correctly so that the insulation is effective and sustainable. If the seal is not correct, the work will be rendered useless. It is important to prevent any thermal transfer through gaps and space which will cause drafts and what is know as a ‘thermal bridge’. 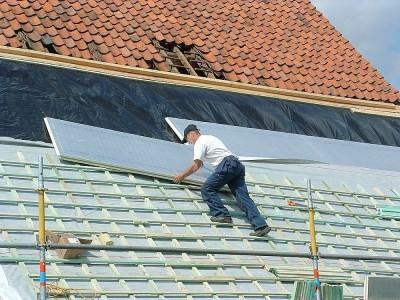 With a warm roof solution, ventilation is needed immediately below the roof tiles. It will prevent any condensation building up, or water getting in through or around the tiles. All this information and advice should be provided to you by the tradesperson who carries out the work. This article was posted in Eco-friendly, General, Home Renovation, Roofing, Soffits, Fascias and Cladding. Bookmark the permalink. Follow comments with the RSS feed for this post.Post a Comment or leave a trackback: Trackback URL.